Privia LLC, the leading provider of bid and capture management software announces the release of Privia version 5.8. This release includes features like search and metadata enhancements, as well as a powerful new graphics commenting tool. 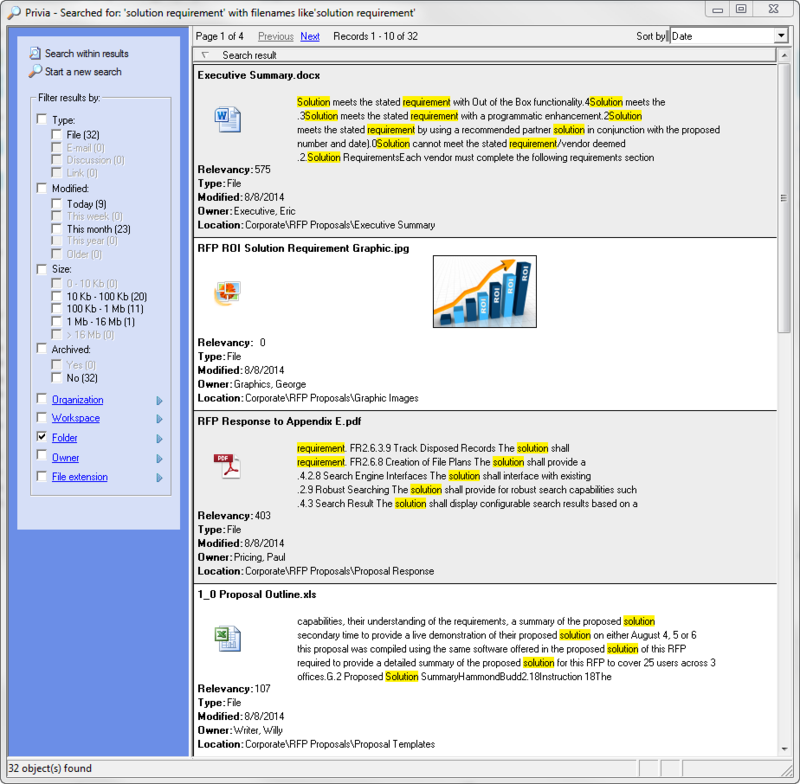 Together these upgrades make Privia software the most comprehensive proposal management solution available. The new upgrade arrives with a host of new features designed to streamline the proposal response process. Improved Search Results - Improved search results are shown using a similar algorithm to Google, displaying inline highlights of the search phrase. Graphics searches are shown as thumbnail images to make finding what you want easy. Dynamic Search Filtering - Improved searches can be dynamically filtered by facets that relate to the search results. Easily Import Metadata - Enhanced metadata for files can now be exported and imported. This allows the user to export a list of files, modify the exported CSV file with metadata, and import it back into the database, eliminating the need to add metadata one file at a time. More than 900 other enhancements have been made. Privia provides an array of products to help organizations streamline the entire bid, capture and proposal process—from pipeline management and reporting to teammate collaboration and proposal development. Leading organizations such as CSC, Management Concepts, Scientific Research Corporation (SRC), USIS, Comprehensive Health Management (Wellcare), Delta Dental of California, Molina Healthcare, Noridian Healthcare Solutions, Optum (a UnitedHealth Group Company), Delex and Telligen are streamlining processes with Privia products to save time and money in areas such as bids and proposals, past performance management, contract management and claims processing. Privia also offers content cloud services to improve the value, access and scalability of enterprise content.